The AM-606HT series are dual Operational Amplifiers that combine high speed performance with the advantages of precision in a single package. This series of Amplifiers with guaranteed performance up to +200°C is the best choice for down-hole, geothermal exploration, undersea cabling, hot engines, aerospace and harsh environmental applications. 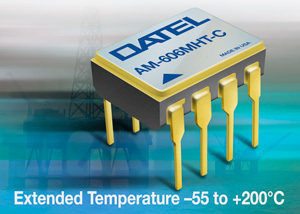 DATEL, Inc. has announced the introduction of the AM-606HT series, a new line of harsh environment amplifiers that are developed and manufactured using processes that originate with DATEL's MIL-PRF-38534 standards and controls. These standards have been extended and increased to meet the demanding -55 to +200°C operating temperature ranges. The AM-606HT has a gain bandwidth of 28MHz, a slew rate of 250V/µs and can settle to 0.01% in less than 180ns while delivering excellent dynamic performance for harsh environment systems. The DC performance of the AM-606HT includes less than 1.5mV of offset, a voltage noise density below 8nV/âˆšHz and a total supply current under 10mA. Offered in either a standard 8-pin hermetically sealed ceramic DIP (MHT) or Gull-Wing SMT (GHT) package, the AM-606HT is a dual, high speed, precision operational amplifier specified for operation up to +200°C. This family of extended temperature amplifiers are designed and qualified to provide more than 1,000 hours of operating life. The series is offered in three temperature grades: A (-55 to +150°C), B (-55 to +180°C) and C (-55 to +200°C). Samples are readily available upon request. In addition to our standard product offerings for down-hole application, DATEL is a leader in providing custom System-in-a-Package solutions (SIP) for harsh environment, down-hole, and high temperature applications.